If you love taking care of plants and dream of becoming your own boss, an indoor plant care business may be for you. You'll need a green thumb and an entrepreneurial spirit to succeed; the bulk of the job involves maintaining plants and flowers in homes and offices. Feeding, watering, trimming, transplanting and replacing them will be your responsibility, keeping houses and business looking attractive with welcoming foliage. Since the overhead for indoor plant care is low, you can give this business time to blossom. An annual income of $15,000 is reasonable for a part-time commitment, while a full-time venture can earn as much as $55,000 per year. Income will vary depending on your specific location and clientele. Targeting businesses, shopping malls, office complexes, hotels, and apartments as your clients will net more profit than private homes because of the concentration of work. Basic plant maintenance required for indoor plant care requires no formal training. 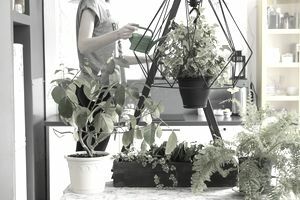 Many who start out providing indoor plant care services have prior nursery experience or have logged long hours tending to their own indoor foliage. Having or acquiring know-how in seasonal plant care and in disease and pest control for plants is critical to retaining the trust and patronage of clients. The start-up capital for an indoor plant care business is very low relative to other businesses; your biggest expenses will be insurance and transportation. You can manage bookkeeping yourself, and if you manage to secure larger clients, such as office buildings or malls, you'll have a large amount of regular income. In the case of an economic downturn, your services will be the first to be cut. Many clients will view your business as a luxury item and will eliminate your role during budget cuts. This problem can make building a reliable income more difficult. Additionally, disease and bugs are a constant threat to plants and your business. A sudden infestation in your area can ruin the plants and your reputation, even when there's nothing you could have done to prevent it. Depending on your state and county regulations, you may need a business license and liability insurance. Also, you will need to produce marketing materials to help get your first clients. A basic website, business cards, and flyers are usually the most cost-effective measures at the beginning. Word of mouth through friends, family, and social media, can also help build awareness and exposure for your business. You will likely need to supply your own tools, so choose well-made items that will last to make the most of your money. Watering cans, pest repellent, fertilizer, soil, shovels, and other tools are all essentials you'll need to bring with you to client sites. Establishing relationships with local nurseries can be very beneficial for you. If you build a strong partnership, you may qualify for discounted rates on plants you purchase on behalf of clients, keeping your costs low. Additionally, some nurseries will give you a commission for plants sold.